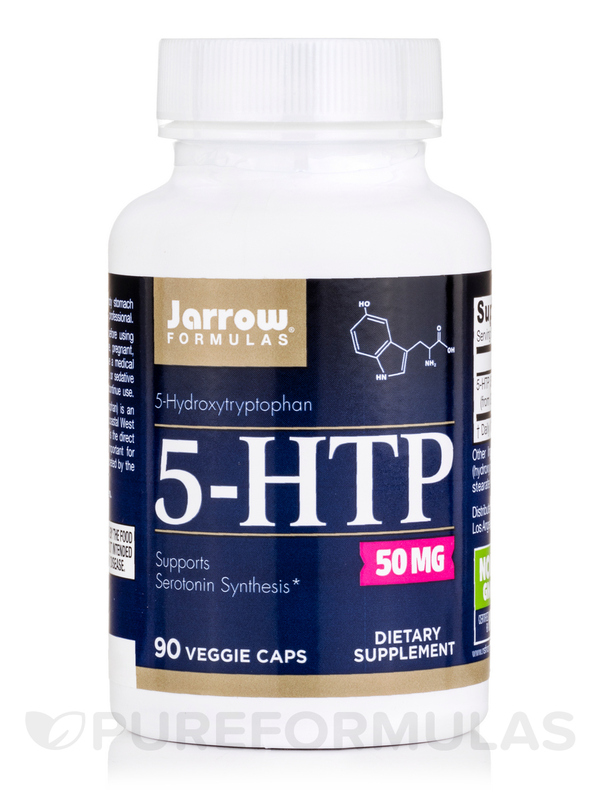 5-HTP 50 mg by Jarrow Formulas has no additives and does not turn orange when added to water. I prefer other brands but the price of 5-HTP can be really high some times. Jarrow is a dependable brand. 5-HTP is one of those supplements I make sure I am never without!!!!!! 5-HTP keeps me from waking up in the middle of the night. 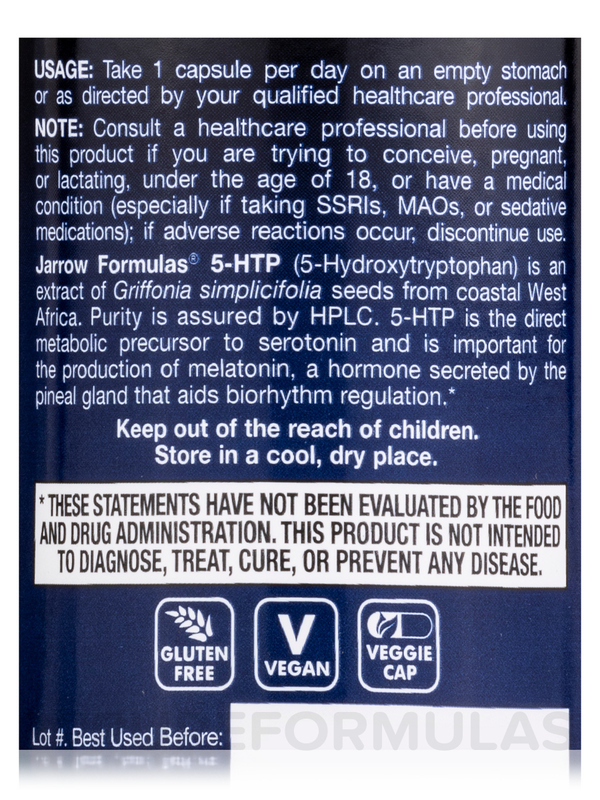 5-HTP Capsules from Jarrow Formulas® might have a positive effect on overall health by promoting emotional wellbeing‚ melatonin production‚ a healthy sleep cycle‚ and by regulating appetite. 5-Hydroxytryptophan (5-HTP) is a chemical by-product of the protein building block L-tryptophan. 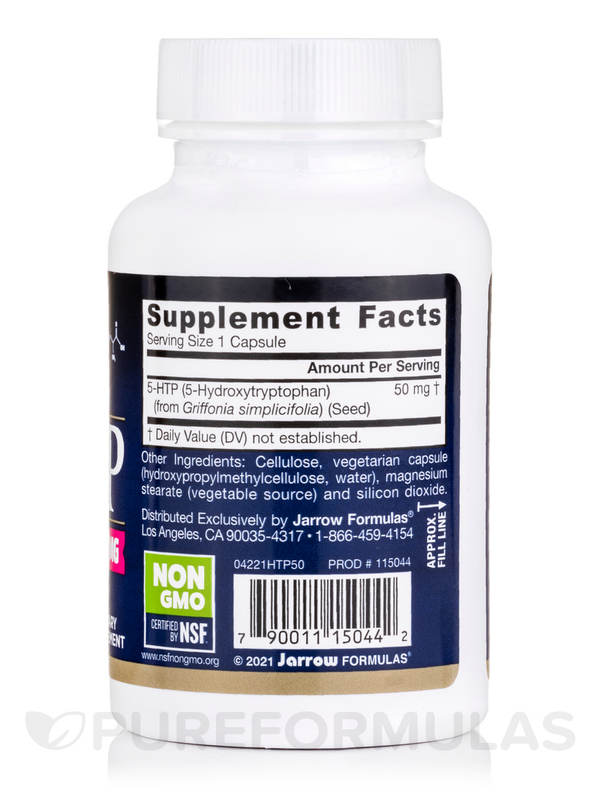 The 5-HTP in the supplement from Jarrow Formulas® is derived from the seeds of Griffonia simplicifolia‚ an African plant. Its seeds are shown to contain up to 20% 5-HTP‚ by weight. 5-HTP is known to help the brain and the central nervous system by increasing the production of the chemical called serotonin. Serotonin plays an important role in the body‚ especially in transporting signals between neurons. Serotonin may affect sleep‚ appetite‚ temperature‚ and pain sensation. Since it is also involved in the production of melatonin‚ the supplement may help improve the sleep cycle. Melatonin is a hormone produced by the pineal gland‚ a small gland in the brain that helps control sleep cycles. 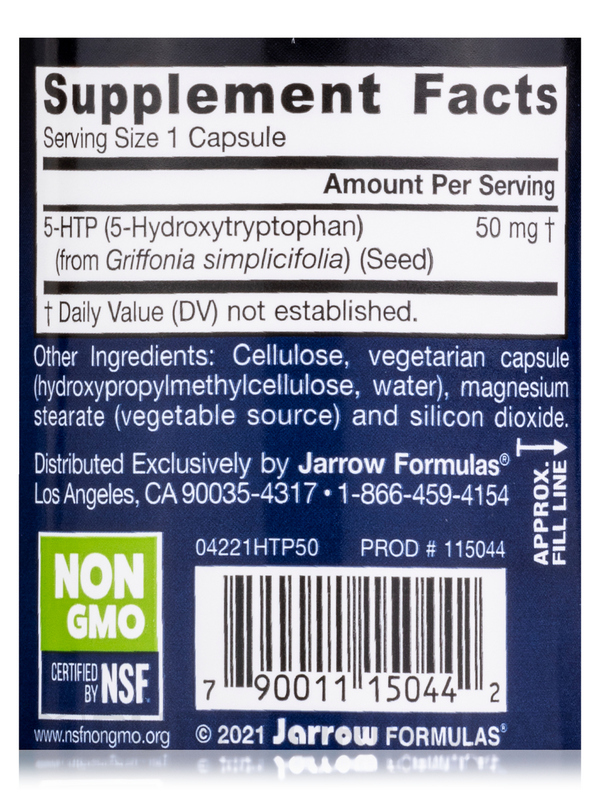 5-HTP Capsules from Jarrow Formulas® contains no wheat‚ gluten‚ soybeans‚ dairy‚ eggs‚ fish/shellfish‚ and peanuts/tree nuts. Cellulose‚ magnesium stearate (vegetable source) and silicon dioxide. Capsule consists of hydroxypropylmethylcellulose. Take 1 capsule per day on an empty stomach or as directed by your qualified health care consultant. If you have a medical condition‚ are pregnant‚ lactating‚ trying to conceive‚ under the age of 18‚ or taking medications (especially SSRIs‚ MAOs‚ or sedatives)‚ consult your health care practitioner before using this product. If your like me and hate taking medicine because of the drugs, and know how much of an effect mental health drugs can do the opposite effect to a person before they find the right one, 5-HTP 50 mg by Jarrow Formulas seratonin inhibitor is a perfect natural way to help alleviate your mood. (Be careful if you're on antidepressants already-these could make it worse, but you can talk to your doctor about adding it in a way that could help) The 50 mg is the perfect dosing to work with to find the one that works for you as well. Natural, and that its game changer. 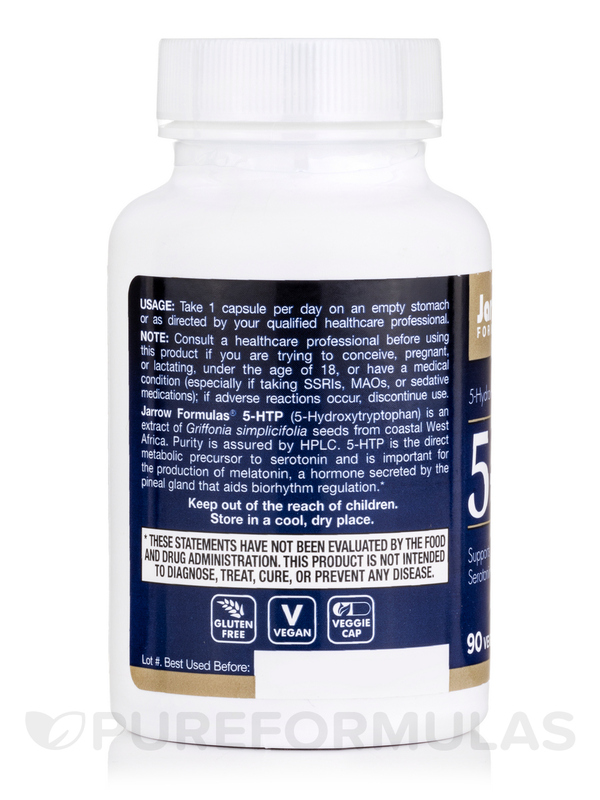 5-HTP by Jarrow Formulas works to help settle you down for a restful nights sleep.